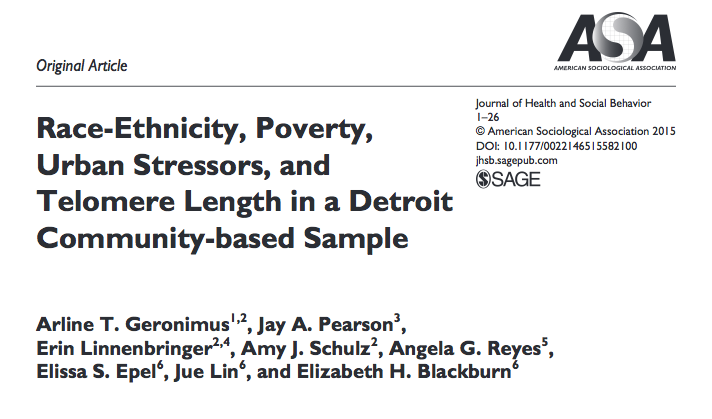 In this study by Geronimus et al published in the Journal of Health and Social Behavior, telomere measurements were taken assuming that race and socio-economic status were valid study criteria. 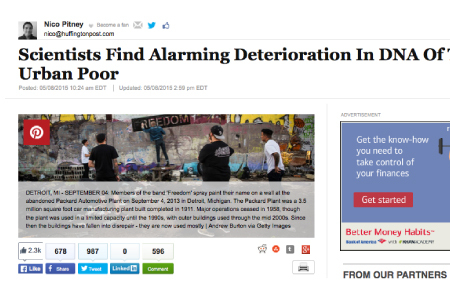 They concluded that for whites, poverty was associated with big differences in telemeres versus the wealthier whites. For blacks, there was no effect of poverty upon telomeres, and for Mexicans, poverty was associated with longer telomeres (presumably because they grew up in more supportive traditional environments). Sadly, we know that race as we define it is a non-entity from a biological perspective. This type of research, in my opinion, may confuse and perpetuates racist stereotypes (like the peaceful peasant upbringing). As a explanatory model, race is a very poor proxy. More relevant would be the presence of adequate support, the stability of family, debt (not just income), employment, and so on. I believe that all people experience life in much the same way. There are stress factors, supports, joys and healing. We can do research based on antiquated models because we have donors, funding, research grants, post-docs, and academic interests. But I would love to see trials of telomerase activators instead of these endless observational fishing expeditions for statistical significance and extrapolated generalizations.